When it comes to fairness and sharing, kids will push things to the limit - certainly beyond the perception of portion size that's visible to the naked eye. 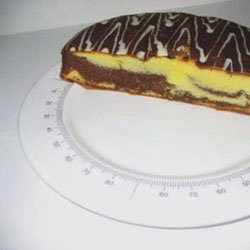 That must have been the motivation behind this cake plate from UpToYouToronto, with a built-in protractor that ensures each wedge can be identical down to the last degree. (Or radian, if your kids are geeky in addition to picky.) Piece'a cake! Very true - and with an inaccurately-placed center, this product is prey to a common design fallacy: the illusion of accuracy!